High Quality Content by WIKIPEDIA articles! 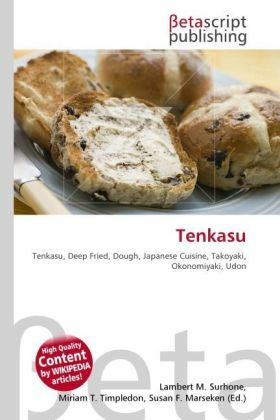 Tenkasuare crunchy bits of deep fried flour-dough used in Japanese cuisine, for example in takoyaki,okonomiyaki, and udon. Tenkasu is also called agedama.Takoyaki is a popular Japanese dumpling made of batter, diced or whole baby octopus, tempura scraps (tenkasu), pickled ginger, and green onion, topped with okonomiyaki sauce, ponzu, mayonnaise, green laver (aonori), and katsuobushi (fish shavings), first popularized in Taisho-era Osaka,where a street vendor named Endo Tomekichi is credited with its invention in 1935.